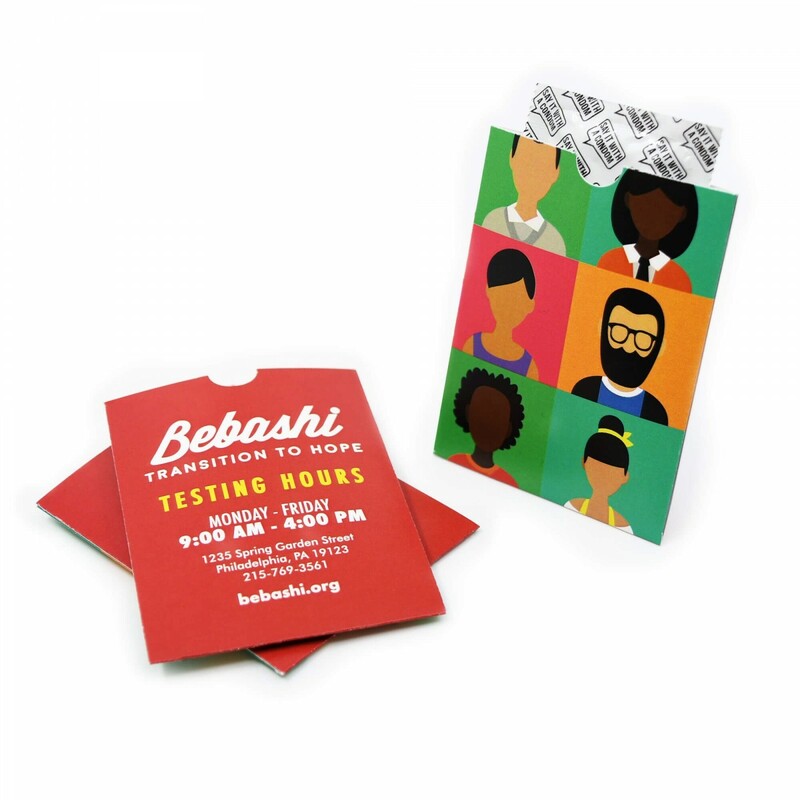 The customizable Condom Holder is an exciting way to add life to your outreach efforts. It's easy to customize and allows for ample room for your branding. Do the Condom Custom Holders Come with Condoms? They are available for purchase with or without condoms. Could Multiple Items Fit Inside the Condom Custom Holder? 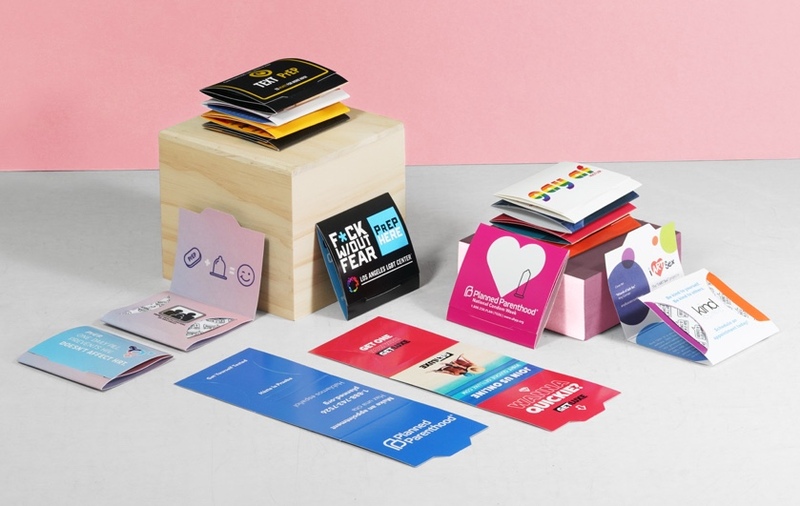 Multiples items fit inside together the Customized Condom Holder, such as a condom, business card, and 3ml lubricant packet. Will a Magnum or Large Size Condom Fit Inside? Yes! The Condom Holder is large enough for a Magnum or similar sized condom. 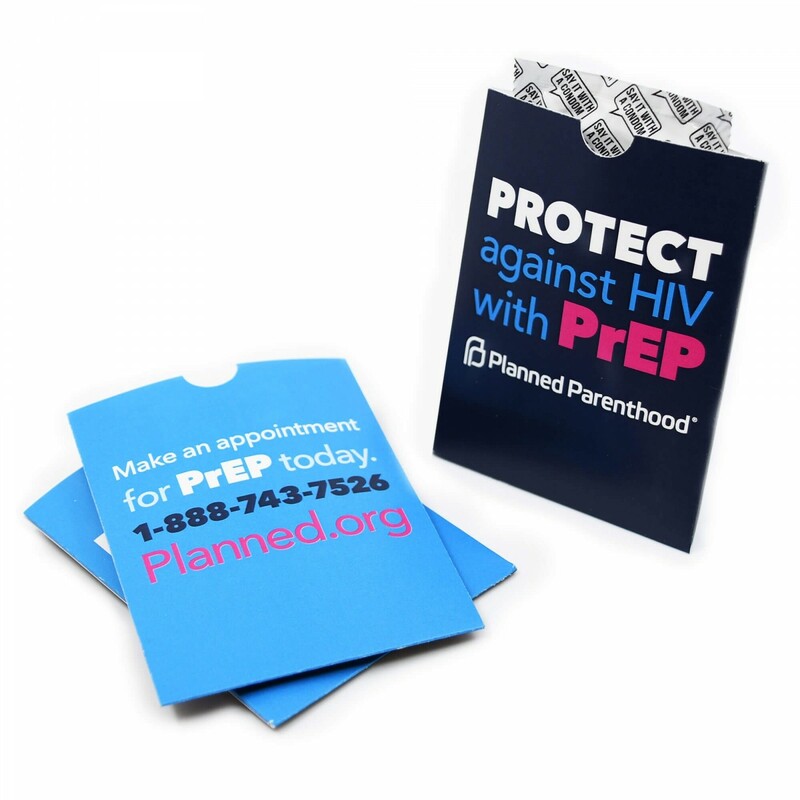 If purchased with condoms, we include our standard Say It With A Condom branded condom foils. For Canada orders, we use Lifestyles or Atlas branded condoms. You will receive a high quality, standard sized latex condom that is made to FDA standards. It is lubricated and has a shelf life of 4 - 5 years. We do not offer extra large or small condoms. If you want to customize a larger size condom, we can use a Magnum or Kyng Condom with our Condom Holders (the condom foil itself can not be customized, but the outer paper packaging can be). There is a one time $50.00 setup fee for this customized condom option. We will keep your artwork on file indefinitely and will waive this setup fee if you place a reorder with the same design. Natural colored latex is included in the price. Assorted colors (Black, Blue, Green, Pink, Red, Yellow) are available for an additional $0.10 per piece. It all depends on the quantity and color of latex you're ordering. You can select the quantity of customized condoms you would like to order by clicking "Order Now" and proceeding to the shopping cart where you can estimate shipping costs. Full color print digitally on orders less than 20,000 pieces. Offset printing is available for 20,000 pieces or more. We do our best to color match your artwork (we ship 10,000's of orders a year and haven't had any complaints). If your order is for 20,000 pieces or more, we can offer PMS matches. Please email us at support@sayitwithacondom.com. If you require graphic design services for your campaign, we charge $150.00 an hour. If you need assistance with typesetting (choosing the right font or font layout), we will provide you with 3 mockups after we've received your paid order. After three mockups have been provided, we will charge a minimum of one hour of graphic design services. Yes! Just click the "Request A Preview" link above and upload your artwork. You'll receive a digital proof within 24 - 48 hours Monday through Friday. Please correspond directly with your account executive once you receive your preview. Please do not submit multiple preview requests for the same design. We will not create a design from scratch for you. If you need graphic design assistance, we can provide this to you at $150.00 an hour.